Four honors students passionate about creating a healthier environment are encouraging MSU to make a switch from plastic to paper water bottles. Madison Hoffman, Mackenzie Dockendorf, Anna Hagan and Ugochi Nwachukwu generated the idea in their “Honors Social Change in the 21st Century” class after a shared interest in helping the school become more environmentally friendly. Hoffman and her classmates did research on plastic water bottles and found that 30 billion plastic bottles are consumed in the United States each year and of those, 80 percent end up in a landfill or the ocean. This has led to major pollution — including a patch of garbage in the Pacific Ocean made up of primarily plastic that is the size of Texas. They also found the MSU’s sustainability plan had no information about reducing plastic waste. The group decided that boxed water was something that could start to address these issues and help MSU begin reducing its footprint. The group has created a petition that has already gained support from 225 people. Hoffman said the petition is important because it’s a representation of student voices that can be shown to dining services and Sodexo and kick start the change. “We want students to get involved with environmental committees and turn this into a snowball effect where people start caring about social and environmental change on this campus,” Hoffman said. Hoffman said that she and her group have the support of Student Government President-elect, MeMe Cronin, and are meeting with Kari Doffing, Dining Services General Manager, to bring boxed water to campus. Additionally, they have crafted a letter to Sodexo, the catering company in charge of all of MSU’s food services, encouraging them to consider making a switch to boxed water on the campuses they serve. A few campuses in the U.S., including Michigan State and Hope College, have already implemented boxed water and the feedback has been very positive. The biggest drawback Hoffman sees for boxed water is the cost. Each box costs 10 cents more than a plastic bottle, which begins to stack up in large quantities. However, she said that she and her group are working with the distributor, Boxed Water Is Better, to bring down the cost with a quantity discount. She also believes the benefits of boxed water outweigh the additional cost. Boxed water is completely recyclable as 76 percent of the container is made from paper from sustainably managed forests that are continually replanted to make up for the losses. The water is purified through reverse osmosis and ultraviolet filtration, which leads to better hydration and taste. Boxed water containers also decompose faster than 450 years – the time it takes a plastic bottle to decompose – making them better for the environment should they still end up in landfills. 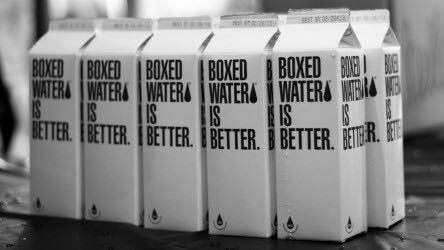 Boxed Water Is Better, the company that would supply the boxed water to MSU, began in Grand Rapids, Mich. in 2009. Since then, the company has gained traction by being sold in major cities like Chicago, New York, Los Angeles and Atlanta. They’ve received celebrity endorsements and also made their way into large music festivals such as Lollapalooza and Austin City Limits where they’ve sold over 300,000 boxes of water. They donate 1 percent of their sales revenue to environmentally-minded organizations. Students wanting to support and the sign the petition to bring boxed water to MSU can do so by signing the digital petition on Change.org.